Claudia De Grandi 'Waves 6' 2018 oils, graphite on canvas, 200x200cm. Claudia De Grandi brings an impressive suite of new works to Bermondsey Project Space – a venue recognized for exhibitions of challenging cutting-edge contemporary art. “When I am painting the action of creating connects me to a greater moment of happening – it is the What and the only thing happening at that moment. Reality is a mystery. When trying to paint it you then realize it’s impossible. As the first artist to be invited to present works on all three floors of the gallery, De Grandi’s installation Waves & Horizons comprises Paintings, Photographs, Prints and Videos. There is a tangible and literal depth of feeling in Claudia De Grandi’s recent works. 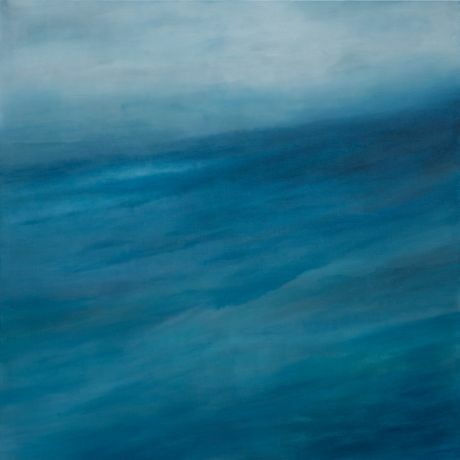 These new paintings from the two series Waves and Horizons are based on her observations and photographs of the Pacific Ocean and closer to home the steel grey waters of the English Channel near to her Hastings studio. They make sublime and alluringly poetic images, referencing as they do the seascapes of Turner and Whistler while at the same time expanding and revisiting the historical Modernist genre of Colour Field Abstraction,. The paintings in the series work equally well as contemporary depictions of light and movement within water, yet are also pervasively drawing the viewer into the abstract. In a noticeably filmic way, some of the paintings evoke the darkly threatening waters of a psychological thriller, you can sense a disturbing, metronomic soundtrack hinting at deep waters and danger below the shimmering surface. These themes actively precipitate De Grandi’s vision for the entire evolving work as a total immersive installation of painting and music which will be presented next year at Fabbrica del Vapore in Milan. This upcoming exhibition, curated by Alan Rankle, is her debut solo showing in London and gives an intimate insight into the development of her project. De Grandi’s works are increasingly attracting art world and press attention via a series of international exhibitions and performance/installations, with her paintings finding eager collectors in New York, Milan, Tokyo and London. A fully illustrated catalogue with essays by Tom Burke CBE, Alan Rankle and John Stezaker will accompany the exhibition. A cutting edge, not-for-profit, creative platform to encourage personal development through visual art and support the fusion of art, photography and culture. Founded in 2015, Bermondsey Project Space is based in the vibrant Bermondsey Street, London. Project Space presents art, photography and moving image from across the UK, offering a flagship venue for both emerging and established artists. This, combined with our visionary educational and early learning programmes, promotes freedom of creative expression through the visual arts.